'Nancy' Wine Nail Series Millesimata Guitars | Fretted Americana Inc.
2014 Paoletti 'Nancy' Wine Nail Series Millesimata. 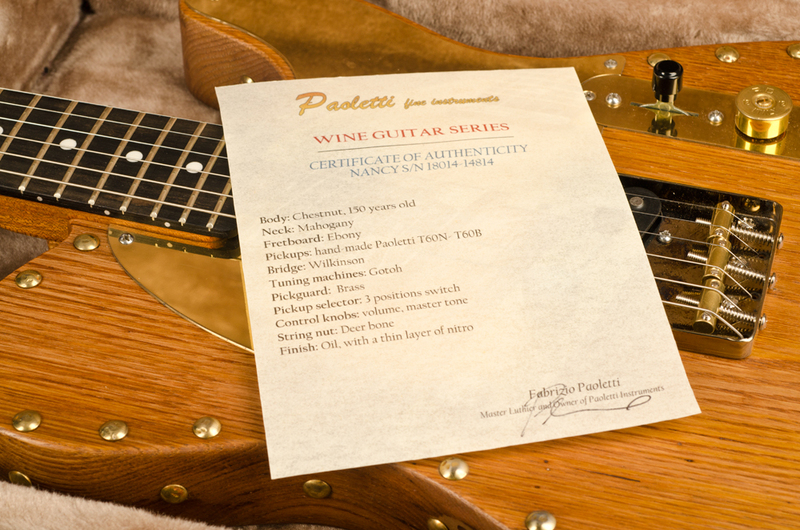 We are very proud to present this custom ordered Paoletti 'Nancy Wine Nail Series Millesimata'. This wonderful guitar weighs 8.30 lbs and features a body made from 150-year-old chestnut wine barrels. 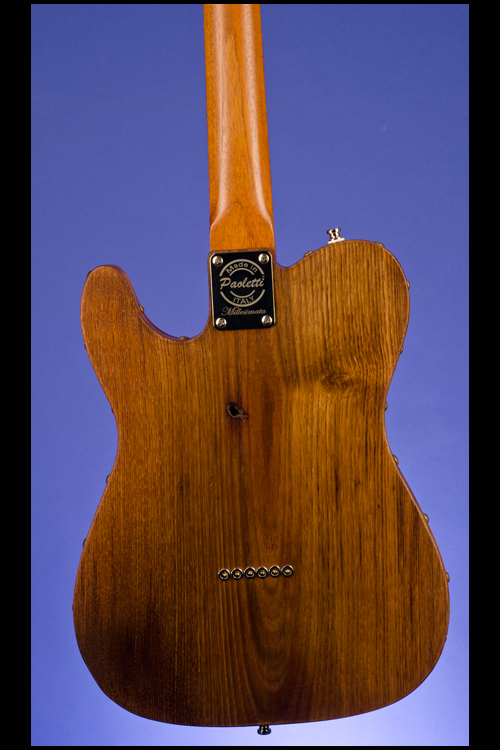 The body has an oil finish with a thin layer of nitrocellulose, which is enhanced by the placing of 26 brass nails/rivets on the top and 22 brass nails/rivets on the edges. 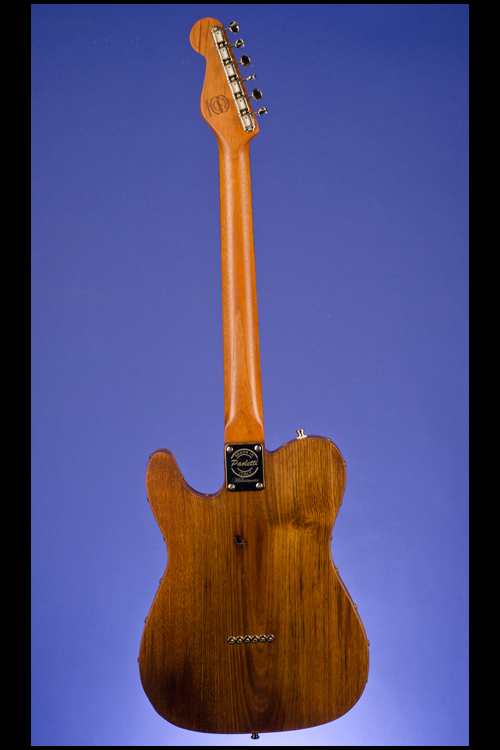 One-piece Honduras mahogany neck with a nut width of just under 1 11/16 inches, a scale length of 25 1/2 inches and a wonderful medium to thick profile. Slab Macassar ebony fretboard with 22 jumbo frets and white dot position markers. Single circular string tree. 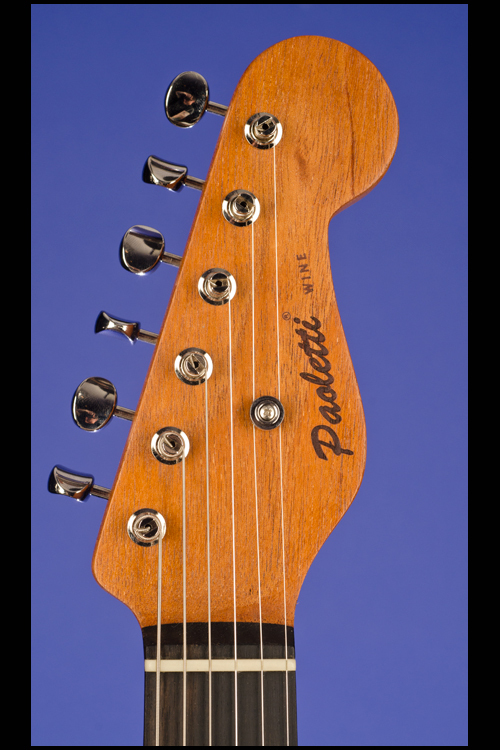 Headstock with "Paoletti" and "Wine" branded onto face. Individual Gotoh 'Kluson-style' tuners with oval metal buttons. 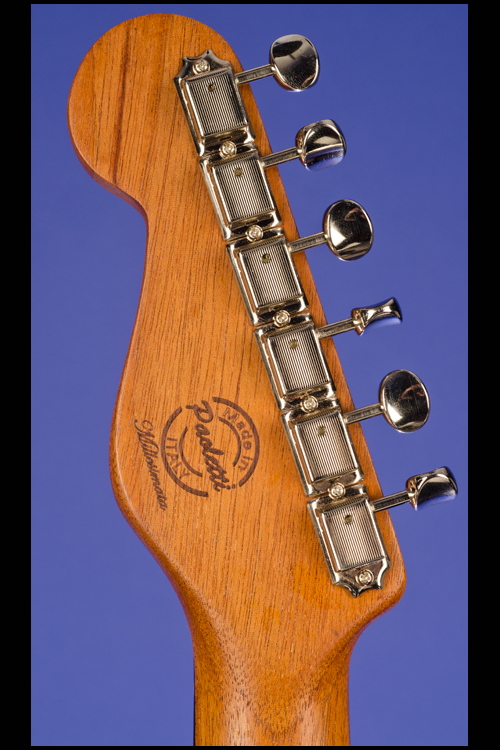 Four-bolt neckplate engraved "Paoletti / Made in Italy / Millesimata". 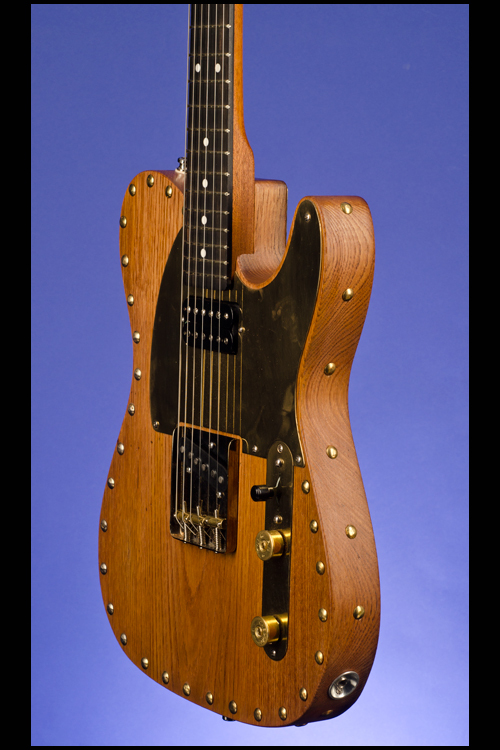 One custom hand-wound Paoletti T-60N single-coil pickup in the neck position with an output of 7.83k, and one Paoletti T-60B single-coil pickup (angled in bridgeplate) with an output of 7.95k. 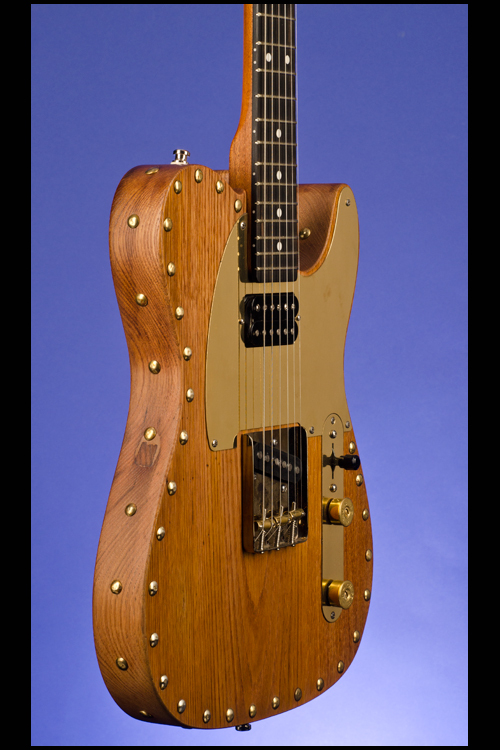 Brass pickguard with five screws. 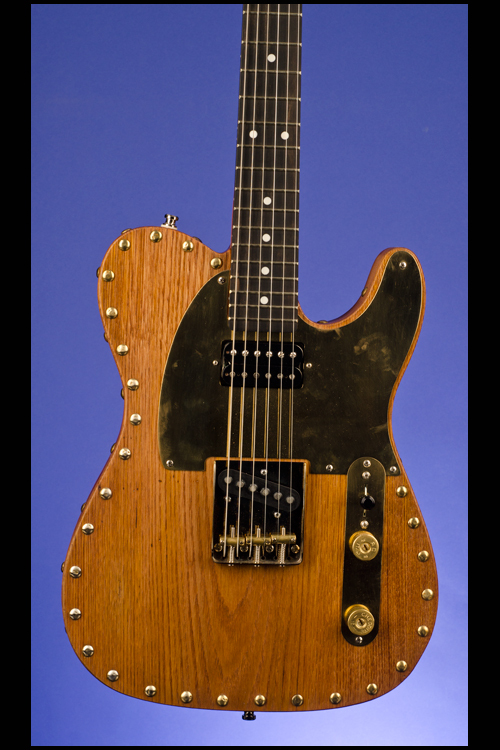 Two controls (one volume, one tone) plus three-way pickup selector switch with black plastic tip, all on brass plate adjoining pickguard. Paoletti brass "Cheddite" cartridge shell style control knobs. Wilkinson 'Tele-style' combined bridge/tailpiece with three individually adjustable brass saddles. This guitar is in mint as new (9.50) condition and is complete with its certificate of authenticity with serial number "18014-14814", signed by Fabrizio Paoletti. 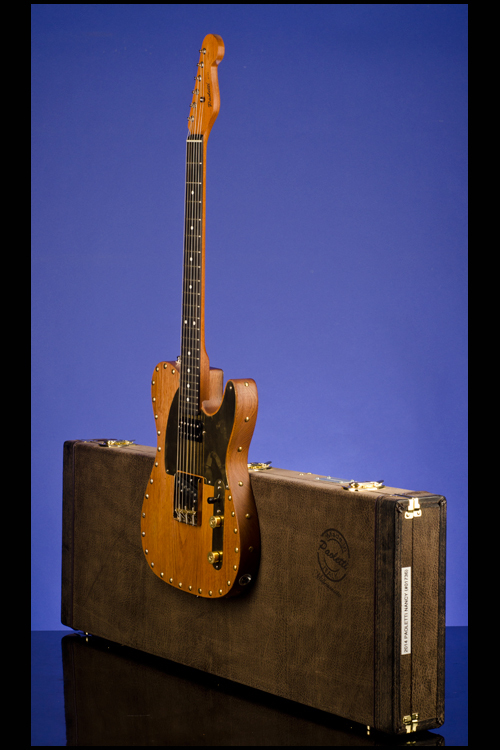 Housed in the original Paoletti three-latch rectangular, brown leather hardshell case with light brown plush lining (9.50). 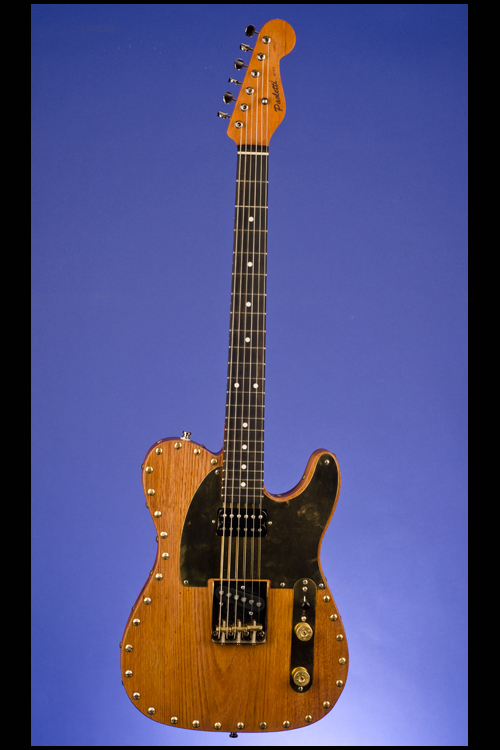 This guitar is exactly the same as the "Monster Tele" that Fabrizio Paoletti made for Phil X to use on the 2013 Bon Jovi tour. The Wine Series Millesimata guitars are the top-of-the-line of Paoletti’s production. Made out of 130-170 years old chestnut woods, coming from Paoletti’s family owned Chianti wine barrels; these guitars are much appreciated by guitar players all around the world. Paoletti Instruments® was established in 2005 as natural evolution of Fabrizio Paoletti’s guitar luthier and amplifier tech activities. Inspired by the shapes of the most iconic guitars in rock history, Fabrizio handcrafted two unique prototypes: a Stratospheric ’57 and a Nancy ’52. Some friends’ precious suggestions led Fabrizio to realize a third guitar, inspired by Van Halen’s 5150. All the positive feedbacks received encouraged Paoletti to apply full time to this activity, specializing in the production of different versions of the Stratospheric, Nancy, Les Paoletti and Skybass models, each one offered with unique features, customizations and first quality materials. In 2009, being confident of the high standards of his products, Paoletti Instruments® got in touch with Italian guitar player Maurizio Solieri, proposing him a collaboration and producing for him the first of his three Paoletti guitars: a Stratospheric Lefty which was extensively used in the 2009 Vasco Rossi World Tour. 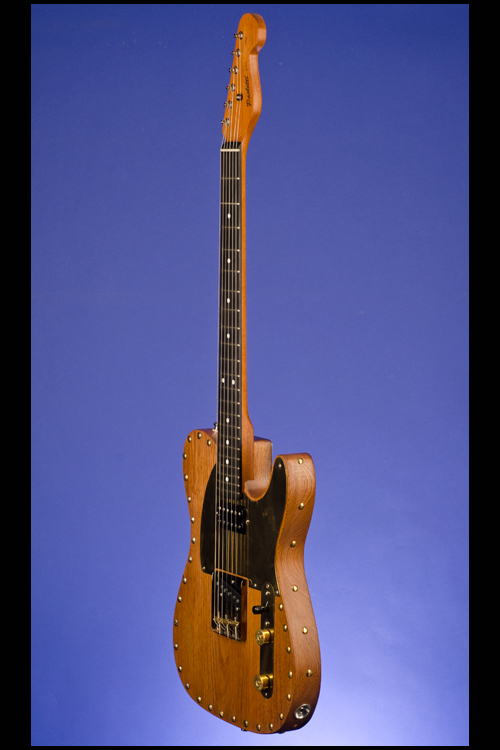 In 2010, using centuries-old woods coming from his grandfather’s farm, Fabrizio Paoletti hand-crafted two Nancy guitars, one for him and one for Bruce Springsteen, who rewarded Fabrizio with a priceless hand written message. After these big successes, the Company started a number of collaborations with important Italian artists such as Marco Carta (Laura Pausini’s husband and guitar player) who played during Laura’s World Tour his Paoletti Wine with a copper engraved pickguard and Elisa Toffoli who ordered a Paoletti Steampunk for her forthcoming tour and TV appearances. James Hetfield of Metallica received his first Paoletti by the end of 2010. Surprised and satisfied of this unexpected gift, he placed a custom order for a Wine D.C. model. A couple of years later, also Kirk Hammett, Metallica’s lead guitar player, received a guitar from Fabrizio: a Paoletti Flying V Wine. In 2012, Tommaso Angeletti joined the Paoletti family as Executive Manager of the Paoletti Sales Department and delivered a Stratospheric Wine to Richie Sambora during his solo tour. A few months later, Richie used his new guitar to play some of the most iconic hits of Bon Jovi during their World Tour and the guitar ended up reviewed in a few Japanese guitar magazines. In 2013, Sambora’s guitar tech (former guitar tech for Angus Young and Prince) contacted Fabrizio to ask for a Nancy Wine guitar for Phil X – world famous session player – who filled in for Richie for the rest of the tour. Phil loved the guitar, nicknamed “Monster Tele”, and used it extensively during the shows of the Bon Jovi Because We Can Tour 2013. The long list of owners of Paoletti Wine guitars includes Richie Sambora (Bon Jovi guitar player and solo artist), Phil X (Canadian session man and guitarist for the Bon Jovi 2013 tour), Maurizio Solieri (Vasco Rossi), Paolo Carta (Laura Pausini), Zakk Wylde (Ozzy Osbourne and BLS), James Hetfield and Kirk Hammett (Metallica) and many more. 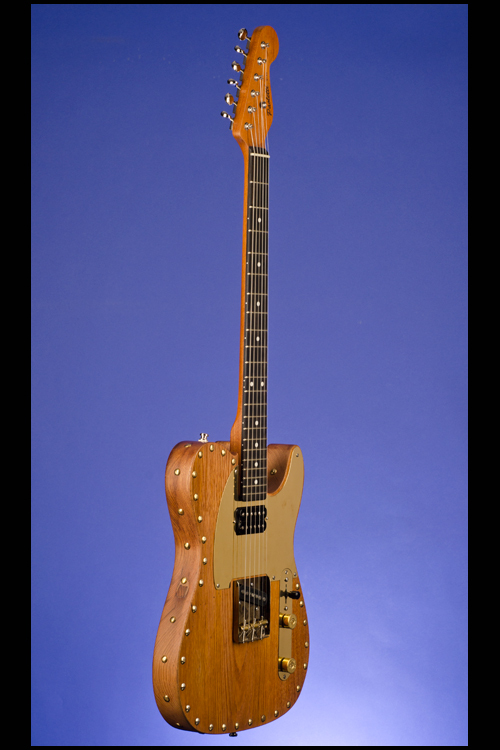 The Paoletti Wine Series instrument range include the Stratospheric, Nancy, Les Paoletti, SG Replica, Flying V Replica or Skybass have chestnut bodies (130-170 years old), with or without the “nails” binding, Honduras mahogany necks, Macassar ebony fretboards, brass pickguards and dedicated custom Paoletti hand made pickups. 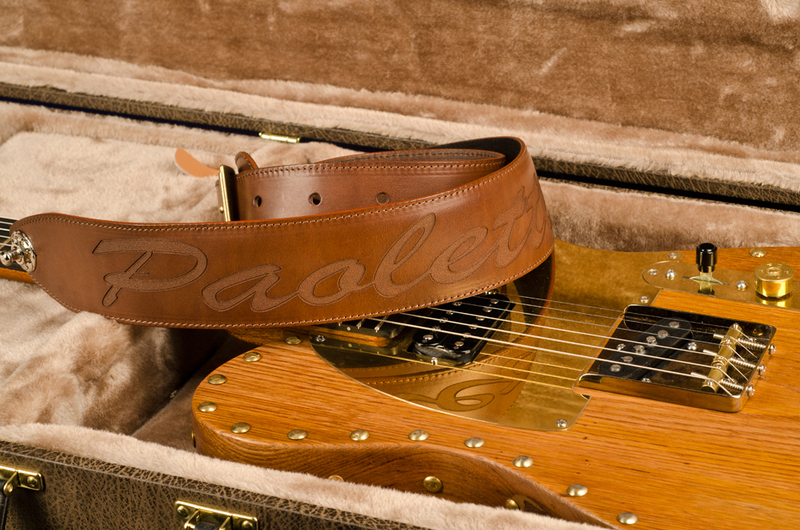 Fretted Americana, Inc. is proud to be the sole USA Paoletti authorized dealer. Any of the above models can be specially ordered from us.